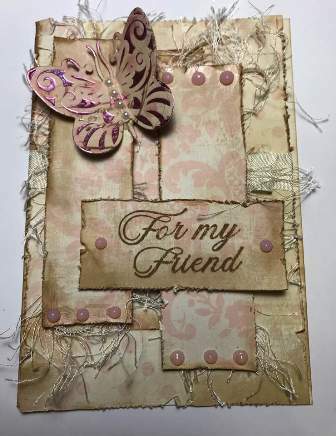 I’m a big lover of shabby chic and was delighted with the new Couture Creations Butterfly Garden Collection as it contains many beautiful designs. This card was one of my first designs using those papers. 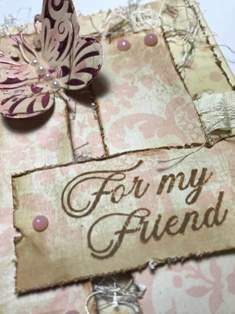 Lightly sponging the edges with Vintage Photo Distress ink, I started with a white cardbase, and cut my dsp just slightly smaller than the base size, then distressed the edges. I then took another piece of dsp approximately the same size, and distressed it as well. Using Vintage Photo distress ink again, I went all around the strips, as well as the piece to be placed on the cardbase. I also added a piece of cream seam binding across the front, but in hindsight this was a waste as it could barely be seen. As you can see above, I placed the three strips at various places on the card. 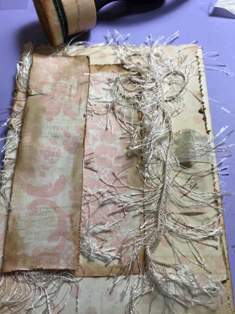 I don’t like things to be perfect for vintage of shabby chic style, which is why I do this. 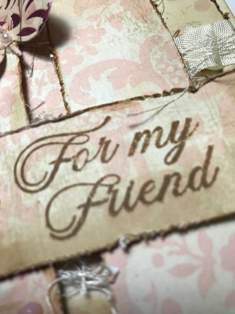 *I added foam tape to the outer two of these, to give the card more dimension. Taking another small (sponged and distressed) strip of the dsp, I stamped a greeting and added it to the left side of the card. 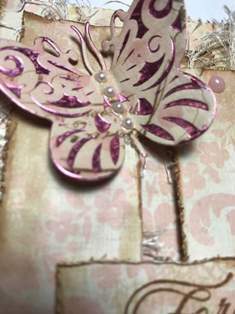 It looked a little bare, so I then took the Cut, Foil and Emboss Nouveau Butterfly and foiled it, and added to the left hand top of the card. I added some small white pearls to the centre of the butterfly. Lastly I added some translucent Nuvo Jewel Drops, and my card was done.